Very short notice on these events, but if you're interested in learning more about beer, read on. Despite the fact that over 40,000 beers from around the world are produced using just four natural ingredients (hops, barley, yeast and water), it seems that 25% of Irish consumers still believe that the beer brewing process involves chemicals, according to a survey by ThisIsBeer.ie. Therefore, ThisIsBeer.ie will host a series of events this November, designed to celebrate beer's four natural ingredients and challenge the misconceptions around one of the nation's favourite beverages. 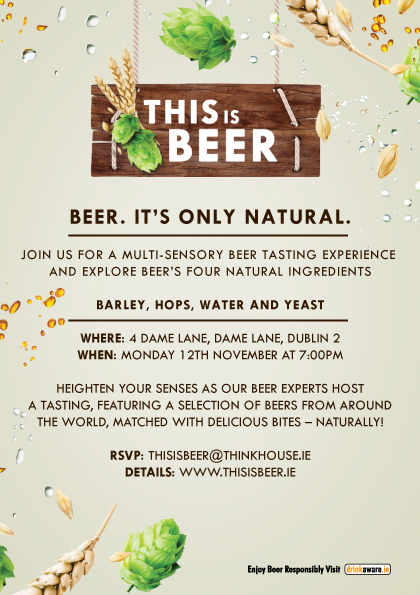 Events will be held in Dublin and Cork as ThisIsBeer.ie hosts multi-sensory beer tasting experiences in Cork on Thursday November 8th, and at 4 Dame Lane on Monday to Wednesday November 12th - 14th. Internationally renowned experts Marc Stroobandt and Fiona Smith will bring to life beer's completely natural brewing process and excite the senses, flavour matching a range of beers with different foods. I have attended tastings with both Marc and Fiona in the past (link) and would really recommend these events if you are starting out on your beer education. Beer fans can book their spot on this beer tasting experience on the This Is Beer Facebook page. ThisIsBeer.ie is a hub for beer fans, as well as those who enjoy an occasional beer, to get the best out of beer. The website includes expert video blogs, beer tasting notes, food matching tips as well as information on beer's four natural ingredients. ThisIsBeer.ie is a Heineken Ireland initiative and features beers from the Heineken range such as Tiger, Coors Light, Paulaner, Moretti, Affligem & Zywiec.